China has decided to curb the capacity of gasoline and diesel cars and raise the bar for electric vehicles, in a bid to build a more competitive automotive industry in the world's largest car market, according to the country's top economic planner. In a guideline released on Tuesday, the National Development and Reform Commission said China would ban the establishment of any new company that produces only conventionally fueled vehicles, including hybrids and plug-in hybrids. Scheduled to come into effect from Jan 10, the guideline is part of a drive to trim overcapacity in the sector and enhance the quality of its budding electric vehicle segment. A third of China's overall capacity of 42.8 million vehicles a year would be idled, according to a study by PricewaterhouseCoopers in 2017. The guideline, however, does not totally prohibit production of more petrol vehicles. If existing automakers would like to build new plants, they must meet a number of criteria, including their current capacity being better used than the industry average for two years in a row and their models being internationally competitive. The plants shall be built in provinces where overall car production capacity has been better used than the average in the country, according to the guideline. 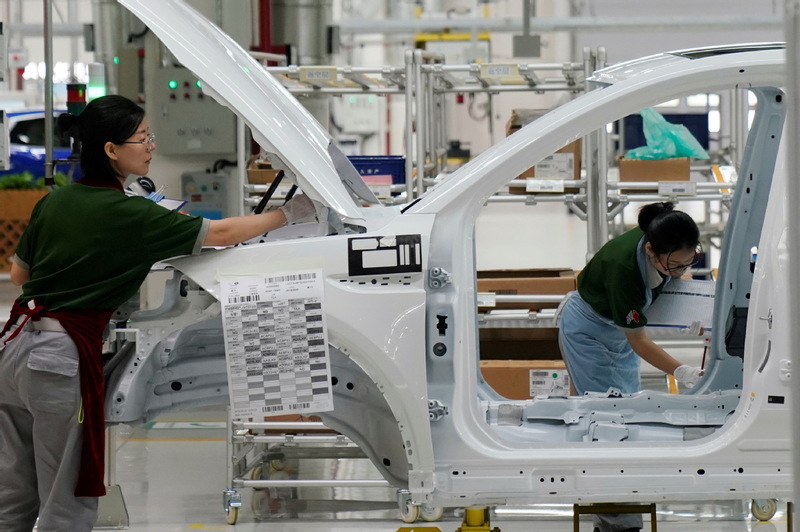 "This shows the government's intention to make the strong even stronger, not only the strong carmakers but also regions with a better car manufacturing capability, so the move would help eliminate outdated capacity in the country," said Yale Zhang, managing director of Shanghai-based consultancy Automotive Foresight. China is set to straighten up its electric vehicle segment as well. China has been the largest market for new energy vehicles since 2015, with more than 1 million units sold in the first 11 months this year, but it does not have star brands of its own. As international brands including Tesla are pouring in, local brands will face grave challenges, Xu Chaoqian, an official at the Ministry of Science and Technology, said at a forum earlier this year in Tianjin. "I have a sense that the challenge will be really big," he said. One measure set out in the guideline is to raise the bar for electric car startups. For instance, they must have research and development facilities, and own the intellectual property for key components of vehicles they would like to make, including control units, electric motors and batteries, before they are allowed to build plants. Besides, shareholders are not allowed to sell their equity stakes before the plants are finished and reach their designed capacity. The plants must be located in provinces that boast a more competitive manufacturing basis and have more new energy vehicles on their roads than the country's average. The requirements will help to cool the overheated sector. By the end of August, more than 20 cities set goals to build themselves into China's "motor towns", according to the Economic Observer newspaper, and their enthusiasm has encouraged electric startups to mushroom, many of which are more interested in subsidies and favorable policies than in car making itself. But for qualified and serious players that meet the demands in the guideline, the procedure has been streamlined, with the longstanding checking and ratifying for approval replaced with filing for records or registration. Before the guideline's promulgation, China handed out licenses to 15 startups since the first was given in 2016, and around 200 are waiting in line, according to Cailian Press, a news outlet in the country. John Zeng, managing director of LMC Automotive Shanghai, said the relaxed procedure is a right step toward building more competitive models by saving carmakers time and money, allowing them to focus on products. "The 'easy admission' does not mean 'easy graduation', because the products will need to go through testing and approval by the industry and information technology ministry before going to the market," said Zeng.